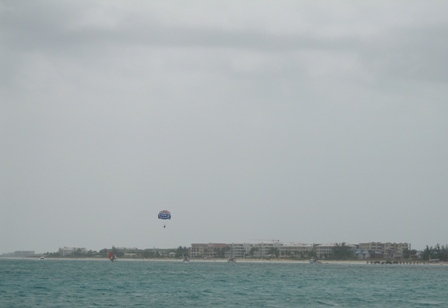 View of Grand Turk Island. Unlike the volcanic Caribbean islands the Turks and Caicos are quite flat, and we were almost on top of the island before we could see it. 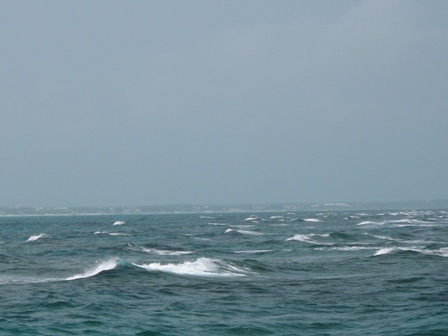 The four day sail from USVI to Grand Turk was an exciting one to say the least. During this part of our Epic Adventure we ran into many thunder and lightning storms with lightning strikes hitting the sea. Fortunately we were able to divert away from most of the systems using our radar as our guide, which showed us from 24 miles away where the storms were located. Never-the-less we were both very excited to finally drop anchor in the incredible crystal clear blue water off Grand Turk Island. 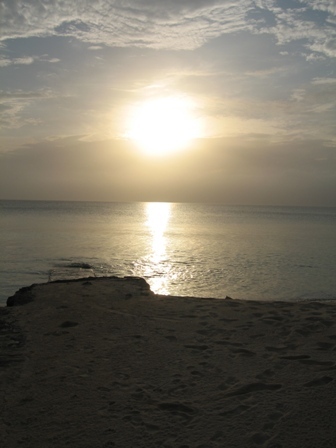 The Turk Islands were said to be named by Sir William Phipps in 1687. Phipps and his men were in the area recovering 26 tons of gold and silver from a Spanish galleon that had sunk when he noticed turk's head cactus (Melocactus intortus) that reminded him of a Turkish fez. Another opinion of where the island groups name originated from, is that when the islands were used as hideouts for pirates, many of these pirates were of Turkish descend. This group of islands were also once called the "Salt Islands", due to the abundance of salt ponds located throughout the islands. It has been said that there continues to be some confusion centered around the postal service where some letters and parcels destined for The Turks end up mistakenly being sent to Istanbul and Ankara for processing. 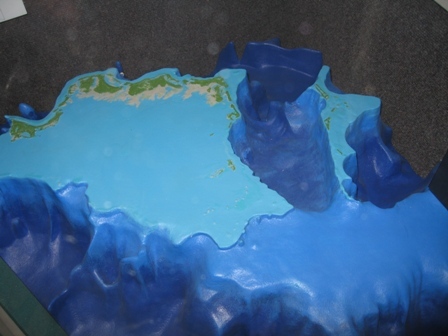 The Turk's Island Passage is a 25 mile wide, 7,000 ft. deep trench that connects the Caribbean and the southwest north Atlantic and separates the Turks Islands from the Caicos Islands. We anchored off Grand Turk Island at South Dock. In just a few feet we went from several hundred feet of water to just 25 ft. We ended up anchoring next to a steel catamaran, hailing from Australia, named Pelagic and got to know Iris and Graeme fairly well over the next couple of days. The four of us would meet in the evenings and discuss the weather forecast, comparing NOAA charts and Grib files. Grand Turk Island is the capital of the Turks and Caicos islands. It is approximately 6 miles long and 3 miles wide. Some say that Grand Turk was the island described by Columbus as Guanahani, his first stop in the New World but most accounts put Columbus' first landfall in San Salvador. However, there has been an increase acceptance of the Grand Turk theory, especially amongst the locals. So much so that in 1989 a Grand Turk Landfall Symposium was held in Grand Turk. Several experts in the field and even some direct descendents of Christopher Columbus were in attendance. Nothing has been proven yet, but that has not stopped the islanders from designating the beach along Front Street a national park, called "Columbus' Landing". A salt pan (pond) in the middle of Cockburn Town. 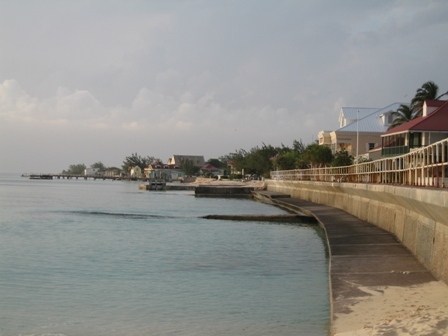 Grand Turk first gained popularity in the 1600's when salt rakers found these small islands that contained brackish lakes in the interior section of the islands. Since Columbus and his Spanish successors had already rid the islands of the indigenous population, these scarcely inhabited islands were easily converted into salt centers. The town was first established by Bermudian Salt Rakers around the year 1677 and continues today to be a British Crown Colony. Much of the architecture is still standing from the 18th and 19th century's, which gives Grand Turk a feeling of Old World Charm. The locals are very nice on the island. 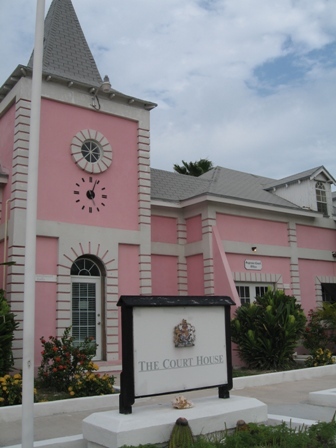 So nice that they even painted their court house a nice soft color. 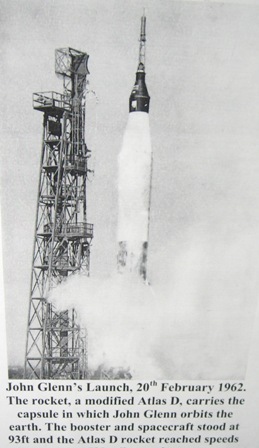 In 1962 John Glenn first set foot back on planet Earth at Grand Turk Island, after his famous space flight. Linden B. Johnson, the Vice President of the US at the time, came and welcomed home the first American to orbit our planet. 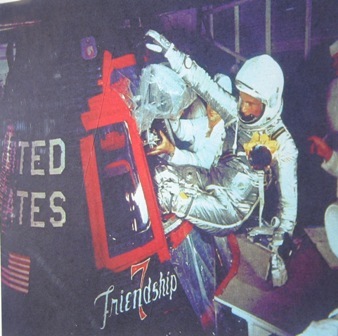 John Glenn was picked up out at sea 160 miles east of Grand Turk Island. 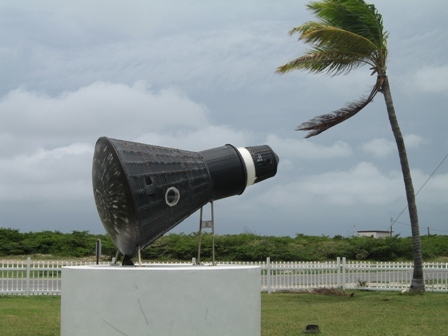 Over the following few years five Gemini and one Apollo craft also splashed down around Grand Turk. There was a wonderful museum in town that told these stories. There were also pictures of Queen Elizabeth when she visited this little island a few years back. We couldn't imagine the excitement that the locals must of had during these incredible events in history, especially since the population totals only about 9,900 people, and that is the total population of all the Turks and Caicos islands that are inhabited! A replica of Friendship 7 outside the airport on Grand Turk Island. The airport was also one of the only place that Marco and I could get Wifi to check email. Queens and Astronauts may come to Grand Turk but the internet has been slow in arriving. After sailing for 4 days it was time to reprovision. I was very excited to learn about Cee's, a whole sale grocery store, very similar to Costco, but a much smaller version. My sister Wendy gave Marco and I this two-wheeler luggage holder when we were in England visiting her and I can't imagine what I would of done without it this year. Since most of the grocery shopping included at least a mile walk the cart enabled us to stock the boat for each leg of the trip much more easily. Thanks Wen!! All rested up, Marco and I took off from Grand Turk and headed for Providenciales (Provo), which is located in the Caicos Islands. A low pressure area was on its way which would bring strong south-westerly winds. 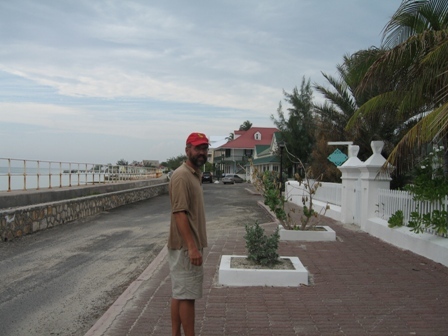 As our Grand Turk anchorage was wide open to the south-west, we headed for a well protected harbor in Provo. 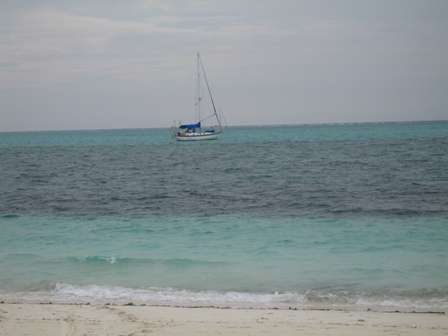 Providenciales is said to have gotten its name from the survivors of a French boat, La Providentielle, that washed up on the shore of this island. 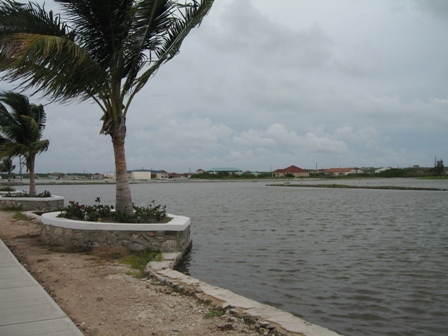 In pre-Colombian times Provo had several Lucayan settlements. Then later, it also became a hideout for pirates waiting to ambush ships containing treasure passing through the Caicos passage. Today it is remains a British Crown Colony. 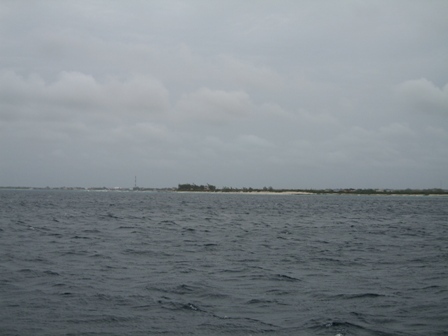 The island Providenciales (Provo from now on) with the surrounding reef offshore. The approach to Provo was through a cut in the reef, called Seller Cut. Reed's Nautical Almanac recommended to call ahead and request a pilot to help us navigate through the channel. We did that but there were no pilots available to assist us, so we decided to make the entrance on our own. The cut itself was marked with navigational aids and we had very accurate electronic chart of the area so we felt fairly confident. We had also read in one of our many piloting books that just like in the high school cafeteria rice pudding, you should avoid the dark bits (i.e. coral heads). 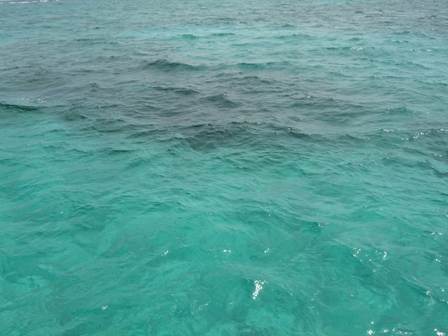 The water was very clear and fairly calm, we also had the sun to our backs so seeing the dark bits was fairly easy. I stood on the bow and pointed to Marco which direction to steer. We made it to our anchoring spot without incident!!! This almost continuous fringing reef with a vertical drop-off of 1,000 ft, is one of the main tourist attractions here on Provo as it is a premiere dive location. This island has almost 30 square miles of protected land and sea that are designated a National Park. Not bad considering that the island itself is only 38 square miles. 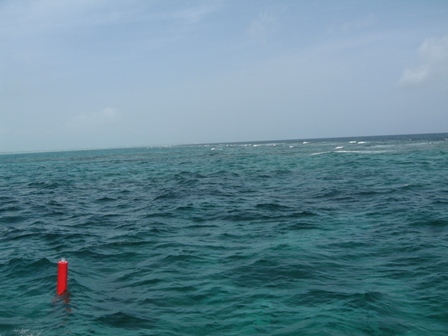 Waves can be seen breaking over the reef in the background, and the red nun marks the channel. One of the many "dark bits" we avoided going through the channel and on our way to the anchorage. Dalliance safely at anchor in 6.5 ft. of water (we draw 6ft) off of Provo. Maybe 15 minutes after dropping anchor Marco and I were relaxing in the cockpit when we had a very special visitor, JoJo!! JoJo circled our boat and stuck his head out to look at us quite a few times. We were both so excited because JoJo is a very unique Atlantic Bottlenose Dolphin. 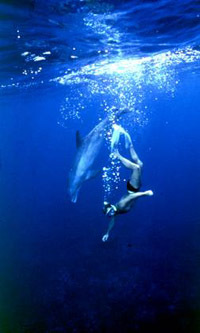 JoJo is one of the few dolphins in the world that has chosen to interact with humans in his own environment. JoJo became known when in 1984 he met Dean Bernal. Dean was a dive instructor and each night he would swim out to the reef where he would meet up with a dive boat to conduct night dives. It was during these ocean swims that JoJo, then a young curious dolphin, introduced himself to Dean. JoJo began to follow Dean each night as he swam to the dive boat and again when Dean would swim back after teaching his dive course. In time JoJo would swim along side Dean to and from the dive boat. These nightly dives became a regular routine with JoJo and Dean and their relationship grew strong. JoJo was known to pull on Dean's regulator hose, trying to drag him away to play during some of the dive classes. Other times he would swim in high speed circles around the dive class, stirring up the silt which would reduce the visibility to zero and the class would have to be canceled. He even herded a 8 ft. shark into the middle of a class once. Occasionally he would patiently wait while hovering over Dean's shoulder and wait for the class to end. JoJo has also shown Dean some amazing animal life in the sea. 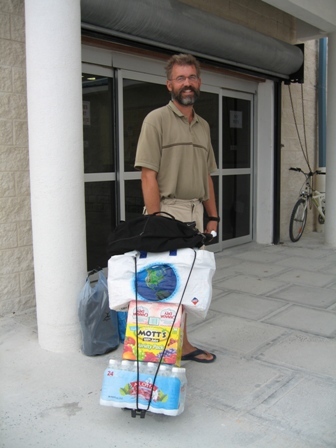 He has brought Dean fish, lobsters, turtles, manta rays, whale, bull and nurse sharks. He even herded in a baby humpback and his mother once so that Dean could see them. Dean said, " My decision to reside on the islands was based on the unique existence of JoJo and the friendship I had established with him due to our many hours at sea. Though JoJo was very young, he had a reputation as a dangerous dolphin. This was because many people would attempt to touch him if he was near shore, and to a dolphin this is an aggressive act that will provoke a wild animal. If someone were to reach out to pet him, he would defend himself with a bite to the offending hand. I never reached out to touch JoJo and continued to marvel at the wild dolphin escorting me for hours each day as I swam in the depths of the ocean." "In 1987, Dean and the Islands were about to lose JoJo as a wild dolphin. Because of his antics with humans, JoJo was seen as a hazard and liability to the tourism industry, and many felt that his future was destined to be spent in confinement or in certain death. 'People were saying that JoJo was attacking them, when in reality it was the people who were harassing the dolphin,' Dean explained. Dean initiated a letter writing campaign and petitioned the government of the Turks and Caicos Islands and the Minister of Natural Resources to declare JoJo a National Treasure, rather than simply confining the animal." Later in 1989 JoJo did become a National Treasure and Dean was appointed Warden, to protect him. As JoJo's Warden Dean has saved JoJo's life many times. Through their trusting relationship Dean has been able to treat wounds that JoJo has sustained from being caught in turtle nets, infections from stingray barbs, and losing a fight with a shark. Dean has since set up the JoJo Dolphin Project. "By 1990, the JoJo Project became well known worldwide. With the interest of the Bellerive Foundation, Dean was able to provide both legal and medical protection for JoJo, as well as public education and research programs for both JoJo and other endangered wildlife. 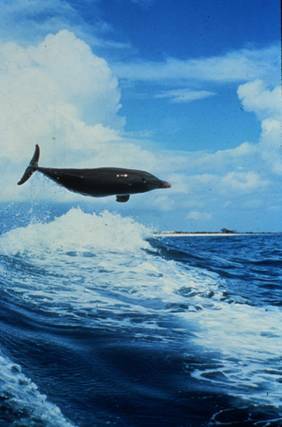 With their appearances in Nature, Robin William's Into the Wild-Dolphins, both PBS specials, and MacGillivray-Freeman's IMAX film, Dolphins, in 2000, Dean and JoJo have become an important symbol for both wildlife conservation and the exciting possibility that man can bridge the gulf that he believes separates him from the rest of nature." "Today the project is an independent grassroots charity. Dean is still JoJo's caretaker and the Director of the Dolphin Whale, and Marine Wildlife Foundation. He works as an international wildlife consultant, writer, and film liaison. Research and wildlife protection are Dean's commitment and passion, but his responsibilities include fundraising, and creating education and medical programs for wildlife. He devotes a good deal of his time to speaking engagements at schools, universities and conferences, all the while lobbying for the protection, study, appreciation of marine mammals." Some of the many resorts and condos along the shore at Provo. As recently as the 1960's Provo only had three small settlements; Five Cays (pronounced key), Bight and Blue Hill. Salt harvest and fishing were its main commerce. Then in 1966, a Swedish surveyor named Bengt Soderqvist met with Fritz Luddington, who had flown over the island many times. The government of Turks and Caicos allowed these two men to purchase over 4,000 acres on Provo. They then came up with seven investors, or "Seven Dwarfs", as they were called and formed Provident Ltd.. These investors included the likes of Theodore Roosevelt III and Richard DuPont. In just five years this group dredged Sellers Pond, created Sellars Cut from the sea and connected the three settlements with roads. They also constructed a hotel and a jetty at South Dock. Provident Ltd. laid down the early ground work for the tourist mecha that Provo is today. The island now boasts about having resorts, marinas, restaurants, condos, residential areas, golf course and a casino and serves more than 100,000 visitors every year. This growth trend looks as if it is only going to continue, with much of the beachfront being built up today. In just under 50 years this island has undergone dramatic changes.